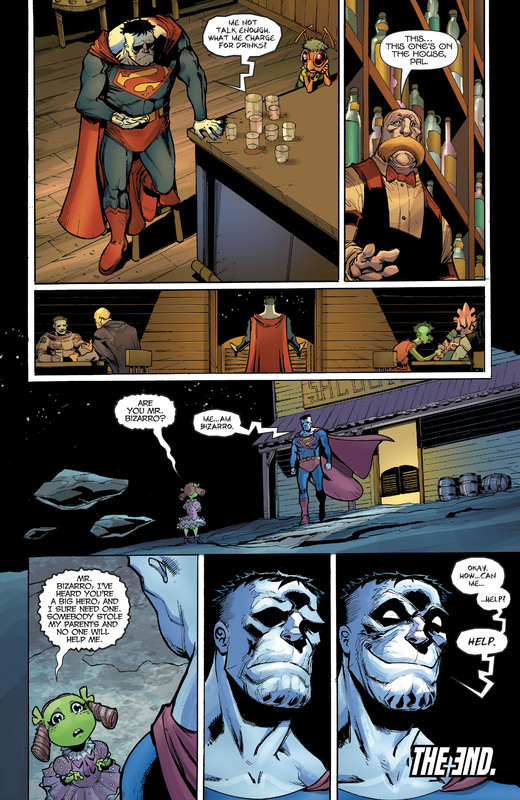 Y'know... Bizarro is one of those characters for whom I have an irrational dislike (just like Man-Bat and Morbius) in that I rarely see good stories told about them, and their concept annoys me on some fundamental level. 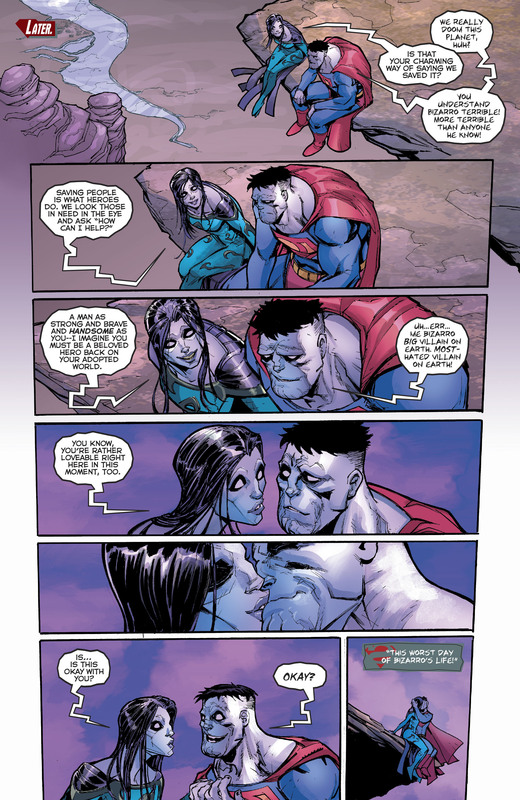 With Bizarro, the whole backwards speaking thing is just aggravating. But damned if Saladin Ahmed doesn't do a good job of telling an entertaining story, which -almost- makes me like the character. I want him to find happiness. Aww. Expected a cruel twist Grotesqua dying or actually speaking backwards all the time or something. 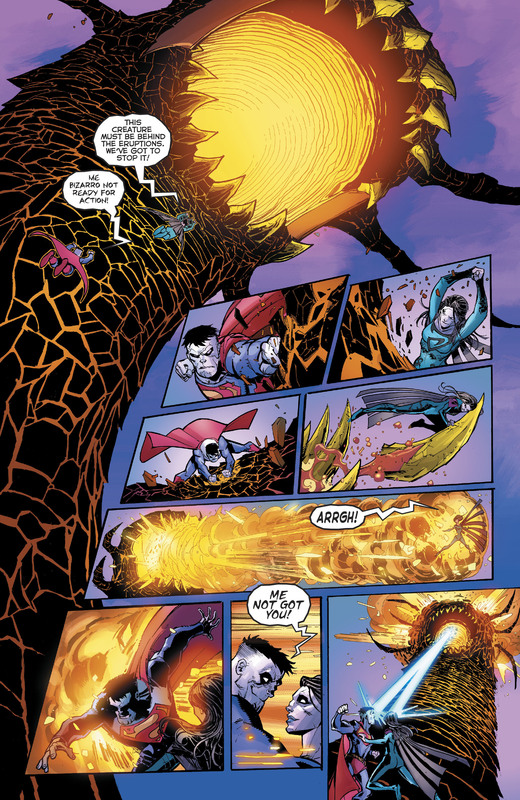 Though it may not be an awful idea since the story kinda lacks a punch or a point, except once again moving Bizarro into a more heroic direction. As unlikely as it is, would be nice for her to show up again. I hope this means the child-abuser dumbfuckery is done with. 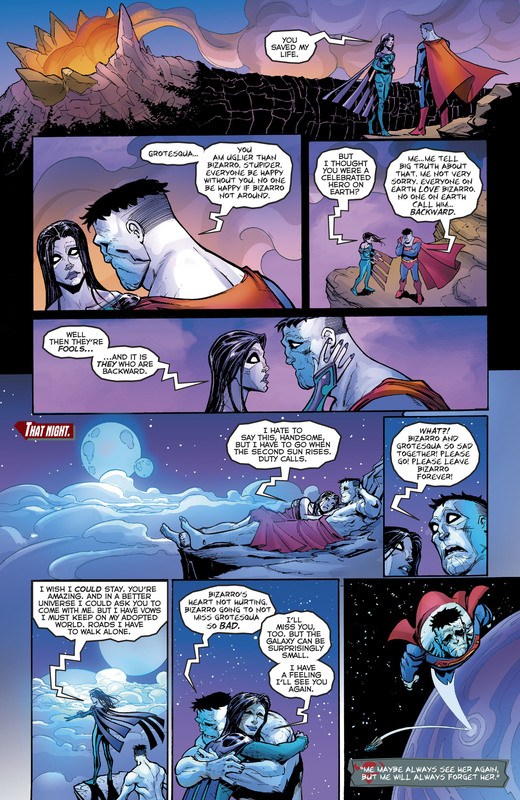 The last story-arc on Tomasi's Superman introduced Bizarro Boy and apparently going by the logic that since Superman is the best parent ever, Bizarro would have to be the worst (because that's totally the opposite thing has ever worked), he and Bizarro Lois were written as just that. To be clear, yes, you can play Bizarro for horror, but he is ultimately meant ot be a comedic character. And even in Silver Age, the joke and the tragedy was that he was just as well-meaning as Superman but was dangerous due to his strange logic/lack of inteligence. Turning a what is meant to be a charming comic-relief into a childbeater is the kind of grim comicbook ridiculousness people have been mocking forever. I thought that would just mean he'd *say* he'd have to be the worst when hey meant the opposite? well, he says worst when he means best, but his mind is very muddled so his attempts to do something are very muddled and wrong headed and backward. In the Tales of Metropolis Cartoon short for example he once reasons that Superman would throw a monster into the sun, so he tries to throw the sun into it. He just burns his hands he doesn't develop some power to hold a star though. In the Hawkgirl story, why was Kendra white?